According to the International WELL Building Institute, pollution is the top environmental cause of premature mortality and contributes to 50,000 premature deaths annually in the United States and approximately seven million deaths worldwide. Traffic, construction, combustion sources and particulate matter can all impact outdoor air quality. Local air quality affects how we live and breathe. Like the weather, it can change from day to day or even hour to hour. Indoor air quality can be affected by the same sources as outdoor air quality. It can also be impacted by off-gassing from building materials (VOCs), furniture and materials, indoor combustion sources and the presence of mold. Poor air quality can result in a wide range of negative health conditions such as asthma, allergies and other upper respiratory illnesses. 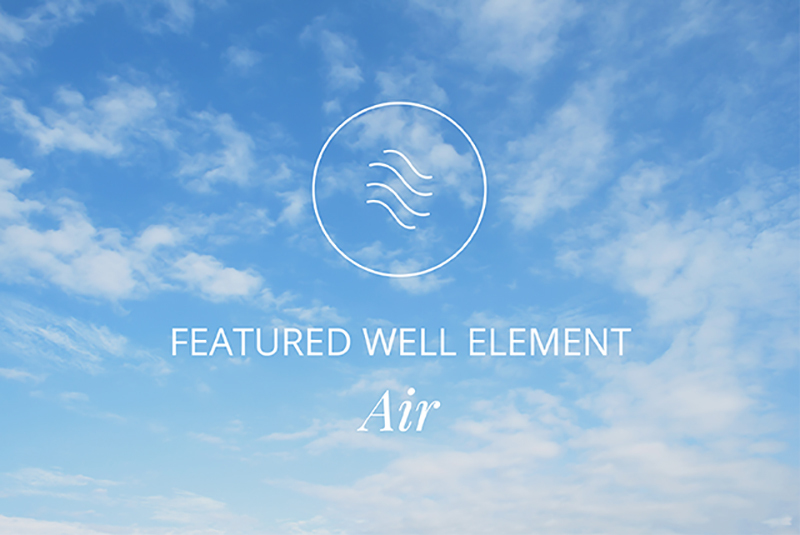 Air is one of the WELL Building Standard’s seven wellness concepts. Its best practices seek to promote clean indoor air and reduce or minimize the sources of indoor air pollution. As the first project in Colorado to pilot and pursue WELL Building Certification, special attention was applied at Lakehouse to ensure the best air possible for our residents. In addition to specific protocols governing cleaning product selection and pesticide management, the community will be smoke-free. Building residents, staff and guests can track harmful contaminants indoors, including bacteria, heavy metals, pesticides and other toxins. A “healthy entrance” was designed for the main entrance at Lakehouse to try to reduce this contamination source. The infrastructure includes a permanent system with grates and grills to capture dirt from shoes before it enters the building and allow for easy cleaning underneath. An air-sealed vestibule with two normally-closed doors also helps to keep outdoor air from entering the building. Every home at Lakehouse has a MERV-13/HEPA/carbon filtration system installed in order to distribute clean air throughout the building. Fresh outside air is filtered before coming into the building, and also the interior air in each residence and common area space cycles through the filtration system on a 24/7 basis. The filtration of the interior and outside air is unique to this product type with the goal that residents, guests and building staff are breathing the cleanest air possible. The system implemented at Lakehouse goes above and beyond what is required by code for a WELL Building Certified residential building. Fresh air and personal access to the outdoors are an essential component of the design of Lakehouse, both within the private homes and common areas. Through careful design, every residence at Lakehouse has an operable window in the bedroom, with some having additional operable windows in the living areas. Each home also features private outdoor space in the form of a patio or balcony. These operable windows and outdoor spaces allow for year-round access to fresh air and daylight. The common areas were designed with Nanawalls to allow for open-air indoor/outdoor living. The team selected a palette of common area furnishings that we hope are beautiful, stylish and functional. In addition, they also had to meet the stringent requirements laid out in the WELL Building Standard. All of the fixtures and furniture in the common areas of Lakehouse were purposefully-selected due to their certification under the ANSI/BIMFA e3-2011 Furniture Sustainability Standard. This standard ensures that all certified fixtures and furniture have volatile organic compound (VOC) levels that are measured and below non-certified products. Limiting VOCs was also taken into account when selecting flooring, cabinetry, paint and other materials. NAVA selected ItalKraft, a Miami-based company specializing in high-end Italian cabinetry because of their modern aesthetic and high-quality products, but also due to their adherence to WELL Building standards through the use of low-formaldehyde materials. To learn more about the connected and healthy Lakehouse lifestyle that awaits, stop by our temporary Sales Center at 1565 Raleigh Street, #108. We’re open Wednesday through Sunday from 10am to 5pm and by appointment. Don’t forget to register online to join our interest list and stay up to date with the latest project news, construction updates, events and neighborhood happenings – Lakehouse17.com.